The man was trapped after the sand collapsed around him. Friends managed to provide an airway as rescuers rushed to the scene. 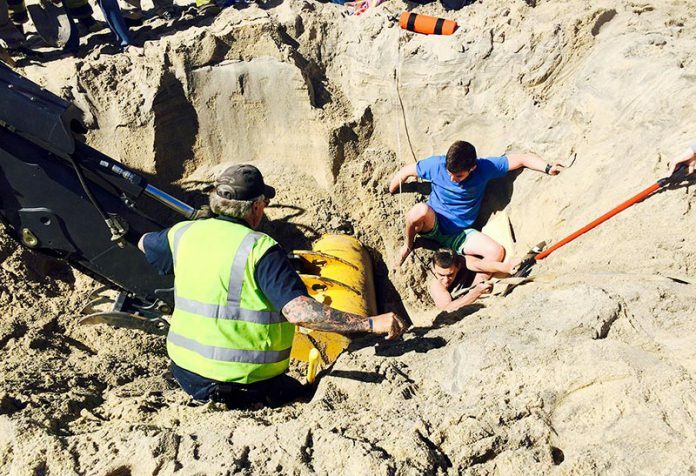 Edgartown emergency responders used hands, shovels, and a backhoe in order to rescue Ryan King, a 19-year-old Southborough teen, who was buried in the sand at Norton Point Beach after a hole he and some friends had dug collapsed around him late last Thursday afternoon. Edgartown Fire Chief Peter Shemeth credited the successful rescue in part to the atypical proximity of both people and equipment to Norton Point Beach. Due to construction on Katama Road, he said, a backhoe was less than a mile away at the time of the emergency. There was also a fire at the airport transfer station prior to the call, so some fire department responders were closer to Norton Point than they would have been otherwise. Mr. King would be the first to admit he is a very lucky man. He is also extremely grateful to his rescuers. Mr. King, a student working for the summer, and a group of nine friends had rented a house in Edgartown for one week on Martha’s Vineyard. The group was enjoying a splendid day on a deserted Norton Point Beach. The two-mile barrier beach that connects Katama to Chappaquiddick is managed by The Trustees of Reservations, and is accessible by over-sand vehicles with permits. The beach is noted for its soft sand, and is popular with beachgoers and fishermen. He said he and his friends had dug two deep holes and were using the space in between the holes as a sort of table on which to play games. As sand fell in, they continued to dig and the holes expanded. Mr. King said it is important that others learn from his accident, which happened so quickly. He said he was aware of the dangers posed by deep holes, and had heard stories about it, but it never occurred to him and his friends that the holes they were standing in could be so dangerous. “It’s crazy how such a great day can turn so bad,” he said. Chris Kennedy, The Trustees of Reservations Martha’s Vineyard superintendent, said a woman who was with the group ran to the ranger shack at the Katama entrance and alerted rangers. 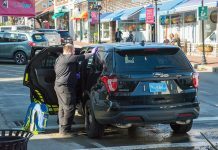 Edgartown Police Sergeant Craig Edwards was one of the first police officers to rush to the scene following the 3:19 pm call alerting emergency responder to a man buried in the sand. Soon after that, Sergeant Edwards said, firefighters arrived and took control of the sand-clearing operation. Once on the scene, emergency responders dug a hole to displace the sand around the buried teen. This prevented removed sand from sliding back down onto him during rescue. Mr. Shemeth said his crew used shovels to get closer, and then switched to using their hands to lessen the risk of harming the trapped man. “We got the sand away and got a strap underneath his arms, and were able to pluck him out of the sand,” the fire chief said. Although Mr. King appeared to be unscathed, he was transported to the hospital for a medical evaluation. The weight of the sand, anxiety, and an adrenaline rush could prevent someone from feeling an injury right away, Mr. Shemeth said. Mr. Shemeth said that the man remained calm throughout the ordeal. The rest of his friends were shaken up, he said, but relieved after the successful rescue. “I talked to them after the fact and told them how lucky he was. Hopefully it was a lesson well learned,” Mr. Shemeth said. The hole that swallowed the man was deeper than The Trustees of Reservations’ regulations allow, Mr. Shemeth told The Times. Only holes two feet deep or less are permitted for adults. Children have even stricter depth restrictions. The regulations are not only to prevent situations like the one at Norton Point, but also to protect vehicles driving on the sand from getting stuck or flipping over. “If someone is driving down the beach at night, or even during the day, sometimes you can’t see a hole. It has happened to [the Trustees] several times,” Mr. Shemeth said. During the rescue operation, a technical rescue team was activated, and traveled to the scene. Tisbury Fire Chief John Schilling explained what exactly that means. The team was activated, he said, and made it as far as the beach. By that time, Mr. King had been removed from the sand. As for what sort of equipment they have, Mr Schilling said it’s varied. At its base is a trailer geared up for a variety of emergencies. The trailer is not designed for beach travel, but the vehicle specialized to tow the trailer is equipped with four-wheel drive for exactly that kind of scenario. The Vineyard team, he said, has 10 to 12 members, and has been training on a regional basis for about six years. Chief Schilling said the technical rescue team was the result of a Homeland Security grant that paid for extra training from the Massachusetts Fire Academy. The idea is collaboration. 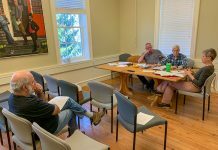 “If individual departments had to do this on their own, it’s very expensive and time-consuming,” he said. Taking teamwork a step further last Thursday, the technical rescue team reached out to E.C. Cottle, a lumberyard in Edgartown. Chief Schilling said that the unprecedented request for assistance was part of a search for two-by-fours and plywood to prevent the hole on the beach from collapsing further around the stuck man. “Cottle’s immediately arrived on the scene. I can’t stress enough the significance of being able to pick up the phone and call someone like that,” Chief Schilling said.